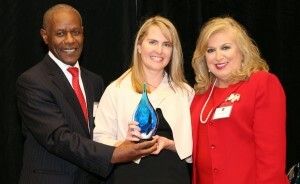 Rebecca Hicks received the SBA’s 2014 Women in Business Champion of the Year Award. Ms. Hicks along with other small business award winners was recognized during the annual DFW Small Business Awards Luncheon at the Sheraton Hotel in Arlington, June 12th. The honorees competed with others from across the 72 Texas counties that the DFW district office covers. Each winner received an award from Herbert Austin, DFW district director. “These entrepreneurs and advocates (are) recognized for their outstanding work in business and in the community” said Herbert Austin.